By a vote of the Norwalk and Bronson Township residents the two school districts were consolidated, in accordance with the state mandate for larger districts. 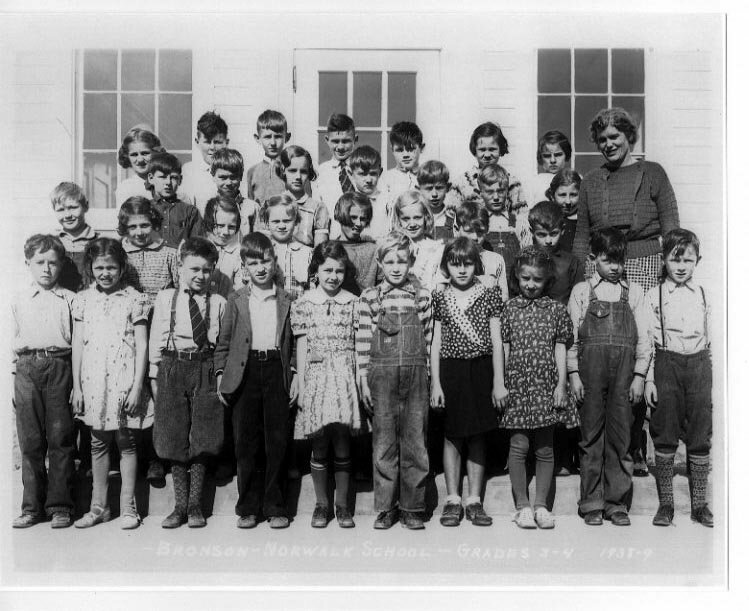 In September 1938 the first classes were held in the Bronson-Norwalk School. Two newer wooden one room school buildings from Bronson Center and Hasbrook Road where moved to the new site and two more rooms were added. This new school located on Townline Road 151 was actually built on the Norwalk Township side of the road. The school closed in the spring of 1981 after 43 years of continuous service. The Norwalk Board of Education subsequently sold the property. The building still stands but is unused and is in very poor condition. The picture found at the bottom of this page shows a group of children with their teacher. They are grades 3 - 4, 1938-1939. This picture was sent to us by Diana L. Harvey of Salt Lake City, UT.